In 1913 D. Cardona Salvador Sanfélix father of the founder of End Week- Sanfélix D. Salvador Soto, currently Hotel Weekend, created one of the first bars on the beach of Gandia. He won hurdle materials. At that time there was no electricity, no roads or water supply. The water was obtained by digging a well and a windmill trasegaba using or generating turbine. This all vacationers and residents was provided at 5 cent. the jug and 10 cent. the pitcher. By the 40s, Salvador Soto and Juana Domenech Sanfélix Palacios founded the picnic area of the beach, which was known as the Prunero, and then moved to a nearby local popularly known as Barrina. It was located between what is now the Club Nautico Gandia and Montecarlo. In the 50’s move to Paris, for training as meter, and stay working for a senior French military official, Jean Bonfanti. On his return to Spain, founded in 1963, local acquaintances Week-End. 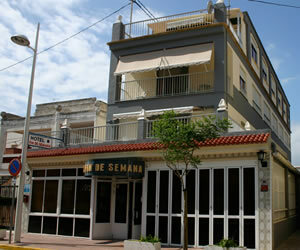 These small local Café and Hotel, inaugurated the different personalities and authorities Gandia, including the pastor of the Church of St. Nicholas is located. The facility was designed to bar-cafeteria and rooms, the latter located at the top of the building. Currently the hotel is in a prime area of Old Beach Gandia, specifically in street mare nostrum, 45, just 50 meters from the beach. The hotel is situated in a quiet location, away from the noise area of nightclubs and pubs, by allowing a break and relax insured all year. 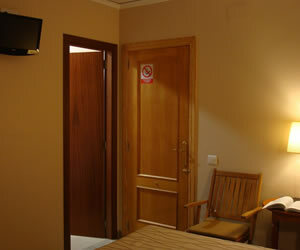 Besides, it is very close to strategies areas such as the Polytechnic University of Valencia located in grao, the Real Club Nautico Gandia, the commercial port area, the St. Nicholas Church, the harbor and the fish market, tourist office from the beach, as well as pharmacies, police checkpoint and red cross. Regarding the facilities have recently been renovated the building retained its original architectural appearance, but adding new elements for improvement. Have parking loading / unloading luggage for customers, cafeteria, dining room, wi-fi, air conditioning, keeping room, first aid kit, among other items. The living room has cable TV (Canal +) and music. Credit cards accepted. It has also affected the new technologies (ICT) and has provided a website where you can see the latest deals and facebook, twitter reserves to improve our customers. Meet the opinion of our customers we are concerned, for them has created a blog and forum for them to express their opinions, suggestions and experiences. 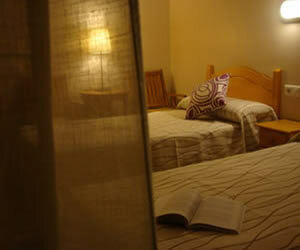 Rooms are comfortable and silent with a classic design. 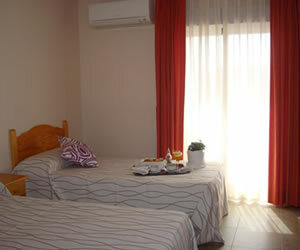 Rooms full equipped, LED TV, air conditioning with or without balcony. Private Bathroom with bath, toiletries and hairdryer. Breakfasts at Hotel Weekend, are something special because it has its origin and experience Continental breakfast (croissants, brioches and freshly baked baguettes and fruite juice), with a very careful quality and personalized service. We have an advisory service to our clients, to inform them of all the cultural and entertainment programming that gathers in Gandia and the region so that our clients can make the most of your stay on the beach. Also collect daily national and local press.